Around the end of 2010 a curious thing began to happen in restaurants across Kolkata and the rest of India. Onions, which along with slices of tomatoes and cucumbers, usually are served as gratis crudités at restaurants, disappeared from the hors d’oevres plate. In fact, they began to disappear from markets and home kitchens, too. 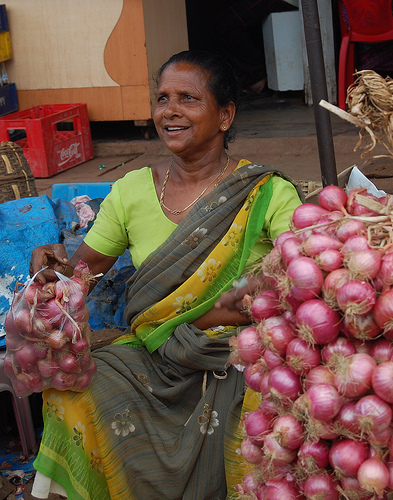 In November, India faced an onion shortage that brought the cost of onions from 5 rupees a kilo to nearly 100 rupees. By January inflation had risen to 18.32%. Kolkata was hit particularly hit hard because West Bengal does virtually no farming of onions. It imports most of its onion from the nearby state of Maharashtra, whose farmers were hit hard by heavy rains that destroyed crops. Normally, Kolkata requires a daily shipment of 30 trucks of onions, but by the middle of January only 15 trucks were entering the city. 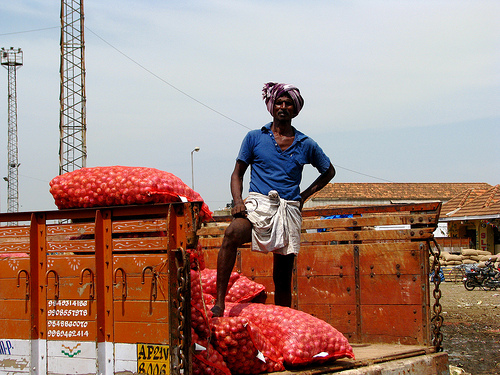 As the shipments dwindled buyers flocked early to the markets to purchase onions. Almost inevitably the stock sold out within two hours. Onions in India were costing more than they did in Britain. 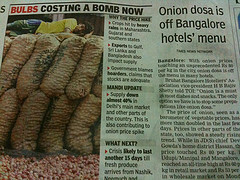 Riots broke out; politicians used the onion for political sway, and newspapers across the globe penned such headlines as, “Stink over Onion Crisis is enough to make you cry.” The headlines might elicit a smirk, but for Indians the onion is serious business. Governments have been known to topple as a result of rising onion costs. The real worry was (and still is) that inflation for food in general had been rising. Prices for tomatoes and garlic, two other essential ingredients were rising as well. But why were onions, in particular, the catalyst for riots? But what caused the price of onions to rise is another matter still being debated in government, among shoppers and sellers alike and in every news outlet across India. Onion inflation is at once simple and complex, depending on whom you ask. Though food prices are always to some degree tied to the vagaries of weather, a host of factors from government to infrastructure accelerated the runaway inflation. India experienced unseasonable rainstorms during the crop season, which led to flooding and a disease called colletotrichum that leads to rotting. The problem can lead to losses as high as 80%. It was this poor growing season that triggered the problem. The uncertainty of weather is a given anywhere in the world, and India has experienced onion crop losses at various times in the last half century. In other words, crop failures were nothing new. Many people thus put more blame on financial speculators who drove up the cost of onions before the crisis in supply existed. Others blame traders and retailers who hoarded the product, thus driving up the costs. Some retailers have even secretly acknowledged that they altered prices throughout the day, depending solely on whether a particular customer was able to afford handing out a few more rupees for a sack of onions. Indian governments have confronted crises in onions before. In fact, the state governments of Rajasthan and Delhi fell in 1998 as a result of a similar onion crisis. And in 1980 India’s Congress party won national elections after making the price of onions a key election issue. Yet, this past year, even though the current government of Prime Minister Manmohan Singh was forewarned of the expected crop failure, and even though it had witnessed previous governments topple over the problem, it made few preparations for the looming crisis. Scientists also say the crisis could have been averted with better agricultural practices. Researchers at the Directorate of Onion and Garlic Research in Rajgurunagar, Maharashtra, contend that if farmers relied on raised field beds instead of flat beds, or if drip irrigation replaced traditional flow irrigation, some of the inconsistencies of weather could be contained. Scientists also argue that because onions are a perishable commodity, their price will always fluctuate unless the industry can rely on better infrastructure. Agriculture, Boris Johnson contemplated in Britain’s Telegraph, is the last unreformed part of the Indian economy, creating a stable stream of food crises each year. While his charge isn’t completely true, India certainly needs greater modernization. Storage is one problem. Traditionally, onions are stored in bags or loose in structures that are not well ventilated. They are then transported on unventilated lorries over poorly kept roads that make the transport of perishables a longer process than necessary. Onion losses from field to market can be anywhere from 50 to 90%. They are the greatest losses of any crop. Many scientists are calling for refrigeration techniques for both storage and transport or, at the very least, improvements in ventilation. This is the real crisis for India. The shouts and riots the erupted during the onion crisis instigated reports across the world and a response from government, but the clamor obscured another piece of news that broke in December. The British medical journal The Lancet reported on the disturbing results of the growing divide between rich and poor in India. A study from the London School of Hygiene and Tropical Medicine found that one in five Indians faced chronic cardiovascular and metabolic disorders related to obesity, while each year 1.8 million Indian children under five died from malnutrition. The fact is that not everyone in India buys onions. 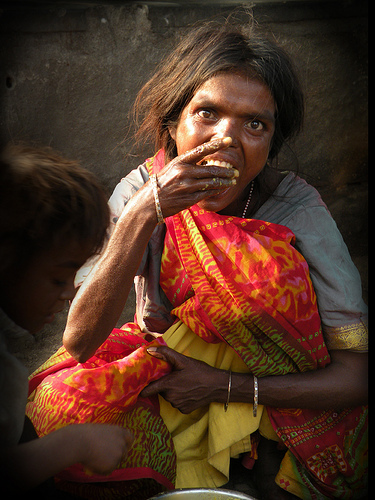 According to 2005 statistics, 267 million Indians still live on less than one dollar a day. In India during any given year the poorest of the poor can’t afford onions. They subsist on rice.